One of the most powerful things about the food we eat is the story it tells. Nowhere is that more true than in Macau, a small, autonomous region on China’s south coast. Today, Macau’s residents are predominantly Cantonese- or Portuguese-speaking Chinese. Only a small portion of the population holds fast to Macanese culture, according to the Guardian, and even fewer speak Patua, the Portuguese-based creole language. Nevertheless, the Macanese are fighting to keep their culture alive. One of the clearest signs that they’re succeeding is the world’s growing appreciation for their culinary tradition. Online culinary students who haven’t heard of Macanese cuisine and its diverse roots are in for a treat – the food is as interesting and mixed as the culture that created it. The world’s first fusion food? Cultures and cuisines have been mixing for thousands of years, but there’s a reason Macau was designated a Creative City of Gastronomy by UNESCO: the metropolis is widely considered to be the source of the first fusion food. Macau was the first (and the last) European colonial holding in China. The Portuguese arrived in the 16th century at what was then a small port town, and quickly set to work creating a place that reminded them of home. This can be seen throughout the city architecture, which showcases swaths of pastel, Portuguese-style colonial buildings and cobblestone squares. Macau also has two official languages: Cantonese and Portuguese. But the most compelling mashup is in the cuisine, which combines Portuguese and Cantonese culinary traditions. As one restaurant owner explained to the BBC, the intermingling of the two peoples led to various attempts to recreate Portuguese cuisines using Chinese and South-East Asian ingredients. From this fusion, Macanese cuisine as we know it was born. Minchi is a signature dish of Macau. In addition to Asian and Portuguese influences, Macanese cuisine takes little bits and pieces from other aspects of the Lusophone world (e.g., Brazil and parts of Africa). Some Macanese stapes are evidently Portuguese, like bacalao, a popular salted cod dish. Then there’s the Portuguese egg tart, a sweet custard encrusted within flaky dough. But the Chinese and South East-Asian influence often shows itself in the form of various spices in ingredients. One example is the popular galinha à Portuguesa. This dish is made by cooking chicken and potatoes in a coconut-based yellow curry sauce seasoned with turmeric. 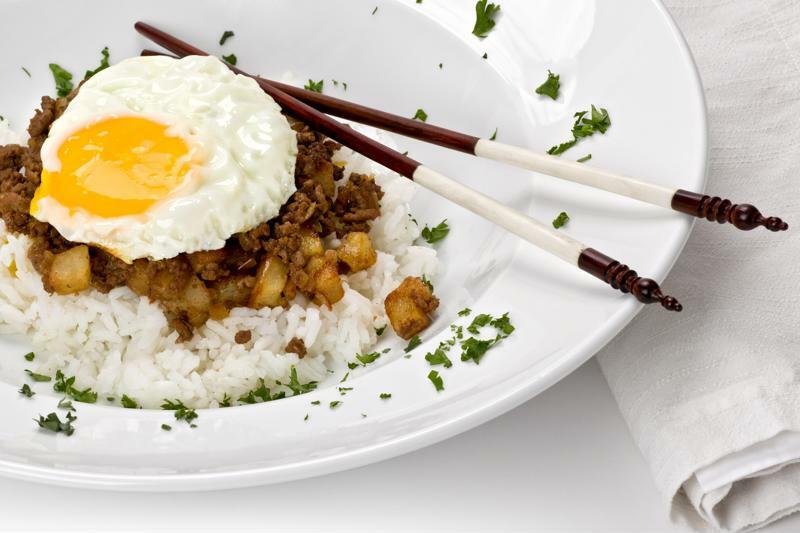 Another Macanese staple is minchi, which is made from minced beef and diced potatoes stir-fried with onions and seasoned with Worcestershire sauce. Then there’s the classic Macanese pork-chop bun. A fried pork chop is simply wedged between a bun that’s incredibly crispy on the outside but soft and fluffy on the inside. Other favorites include capela, a Macanese-style meatloaf usually made from pork, Macanese chili prawns, and tamarind-braised pork, which is stewed in a tamarind shrimp sauce, salted and seasoned with chilies and bay leaf. On the sweeter side, you have serradura, a simple but delectable pudding that combines whipped cream and crumbled Marie biscuit. Arroz doce (sweet rice pudding) is another Macanese classic. Walk around Macau, though, and you’ll quickly find a wide array of fusion pastries and desserts with flavors that defy straightforward cooking traditions. You can find Macanese-inspired eateries all over the world. In the U.S., there’s Fat Rice in Chicago (head chef Abe Conlon won the James Beard award in 2018), Macao Trading Co. in New York City and Macau Cafe in Sacramento. Macanese cuisine isn’t mainstream by any stretch of the imagination. Still, its creative flavors and fascinating origins truly bring something unique and exciting to the culinary arts, and are worth a pilgrimage to the nearest restaurant – and some experimentation in the kitchen.